Travel can be one of the most rewarding experiences you can pay for. However, it can also be one of the most expensive. 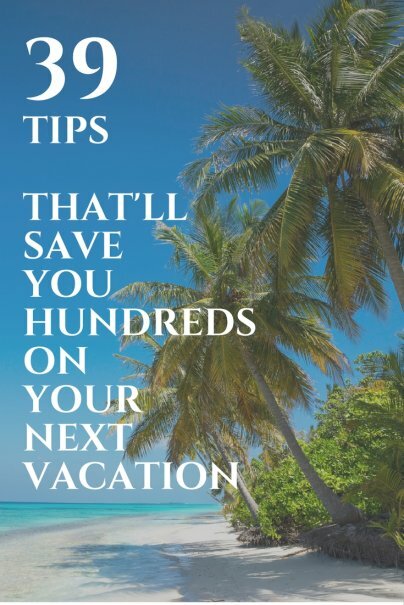 Fortunately, there are ways to cut costs so you can afford your dream vacation. Read on for some of the best tips to save on the upfront costs of your next trip. If you already have several destinations in mind, then check out travel flash sale sites, which can save you hundreds of dollars! Here are a couple to browse through. Try up-and-coming cities for some of the best deals. Big cities like New York, Rome, San Francisco, and London are always popular, but other places that may not make the rock-star list often offer you more bang for your buck. If you're planning on stopping by a lot of locations, then take a look at some cruise deals. It may be cheaper to travel by boat with an all-inclusive deal. That way, you may be saving on additional airfare, lodging, ground transportation, and meals. Check with your organizations to see what kind of travel discounts they offer. Some to consider include AAA, the AARP, or warehouse clubs like Costco. Get discounts on your flight, hotel, and even your planned activities like visits to amusement parks. If you change your mind on traveling, then cancel your plane ticket within 24 in order to get your money back without penalties. Use tools like Bing's Price Predictor feature to see if the ticket price is predicted to drop or rise. The tool even gives a "confidence" percentage in its evaluation for a better gauge of accuracy. A third-party audit has found that the Price Predictor works 75 percent of the time. It goes without saying that booking unpopular flight times, such as with red-eyes, weekdays, or off-season periods, will garner better prices. Travel on Tuesdays, Wednesdays, and Saturdays also tends to be cheaper. Signing up for a credit card that will give you great travel rewards would be worth considering. Before doing so, keep in mind that you should only charge what you can realistically pay off soon. That said, if you know you can pay off what you owe, then travel reward credit cards will be a neat way of earning free flights and hotel stays. Here are some good options. When you're in a foreign country, you can get some of the best currency rates by swiping your credit card or withdrawing money from a local ATM with a debit card. Research to see if the Go City Card will save you money. It's available in nine US cities and lets you visit selected attractions for free for a fee. It's worth getting if the attractions you are planning on visiting are on the Go City Card's list. The best times to buy your tickets are Tuesdays and Wednesdays. More specifically Tuesday at 3 p.m. EST. Don't buy your tickets on the weekends, as they are the most expensive then. If you don't want to commit, some airlines give you the option of holding your seats; Continental lets you hold it for 24 hours and allows you to cancel without penalties. You can also lock down the fare for three or seven days, but it comes with a $5 or $9 fee depending on your chosen time frame. If you buy your ticket early, then be sure to track it on Yapta.com to see if the price changes. Yapta will send you an email alert when it finds that you can change your ticket without taking a loss on rebooking fees. Oftentimes it's better to book through the airline so you'll be able to to see all the hidden fees that are not necessarily revealed through a booking website. You can also sometimes find deals that are only available on the airline's website. There are some companies like Orbitz that will refund the difference to you if you find a lower rate on a ticket on another site. Research the different travel sites and see which one offers a similar service. After you buy your ticket, keep looking at other sites to see if the ticket price goes down. Oftentimes, third-party sites don't show many specials that are featured on hotel sites. Check both the hotel and the third-party site before booking the best deal. Fancy a stay with a homey feel? Check out Airbnb.com, a site where individuals rent out their rooms or house to travelers. I found some pretty great deals on the site, with discounted pricing on rooms situated in prime locales. The multiple pictures will give you a good idea of what the rooms look like, and if you're still a bit hesitant, there are plenty user-generated reviews for you to check out. Want to not spend any money on your lodgings? Explore CouchSurfing.org, a volunteer-based network in which you can crash on someone's couch for free. It's a great little community that may enrich your travel experience, because your couch-surfing pal might show you some of the local sights. What better way to view the city than through the eyes of a local? Bonus: you might even make a lifelong friend! Becoming a loyal member of a hotel chain will get you lots of benefits, such as discounted prices, better service, and the ability to collect reward points toward a free hotel stay. And if you play your "I'm a loyal member" card and negotiate, then you can even get a full refund on your money when you cancel your stay. I've had to do that a couple times and saved a ton of money in doing so. Some of the more famous hotel reward programs include Starwood Preferred Guest, Priority Club, and Hilton HHonors. And there is good news for those who prefer independent hotels. Turns out, there is a growing trend of boutique hotels grouping together to form their own loyalty programs; check out Stash Hotel Rewards and Voila Hotel Rewards. Check out the local Craigslist for short-term vacation rentals, but be careful! People who don't their homework can end up forking over cash to a scammer for a vacation rental and not seeing any of it back. Read these safety tips by Craigslist, and try to have a friend check out the place before you send them money. Trim off travel costs by staying at a hostel, and spend about $15 to $35 a night. A popular place to find hostels is hihostels.com. Hostels have evolved from their traditional image, and some of the choices on the website even include private rooms for couples, families, or groups of friends. If you're a first-timer, then be sure to prep yourself before the trip by remembering to bring things like shower slippers and ear plugs. Don't just call it a night at any price. If you're refraining from making reservations before your trip, then try to negotiate a lower rate for your room when you pull in for the evening. You'll find the most success at accommodations with several noticeable open spaces in the parking lot. Boutique hotels can offer a great price, but be sure to do your research properly, because they can be just as costly and swanky as the higher-end chain hotels. You can check out Orbitz for boutique hotels such as Tablet Hotels, or you can comb through Google search results on your own by using the search terms "boutique hotel [insert city]." Be sure to check out Trip Advisor reviews to see what other people are saying, and if it's in another language, then use Google Translate! You can try your luck and opt to blind book on sites like Priceline.com and Hotwire.com and pay for a room in an unknown hotel. The risk is, you won't be able to cancel or change your reservation after you find out which hotel it is. Do some digging around on betterbidding.com or hoteldealsrevealed.com to see if there are any tips for improving your chances of getting the right hotel. These are forums focused on how to "game" Priceline and Hotwire sites. Now I assume hope you regularly research prices of flights and hotels before booking, but what about activities? Along with the added perk of looking for reviews to determine whether a particular stop is a tourist trap or worth the money, you can also save money booking "big-ticket" items. Museums, theme parks, and other destinations often offer discounts for activities prebooked online because so many people don't do this and are willing to shell out more cash at the door. Don't be this person, and thoroughly research your destination and activities. In addition to checking out the tourism board, my favorite place to stop is the website of the local paper or city magazine. Periodicals geared toward locals usually have reviews of newer places and upcoming events — sometimes even discounts, too! You'll be charged anywhere from four to eight percent of the cost of your trip for insurance, but considering what's at stake, the extra money may be worth it to protect your investment and buy you piece of mind. Using websites like Priceline could get you half-priced hotel rooms. That being said, shop smart! Playing up the best features with professional photos is the name of any hotel's aesthetics game, but stave off disappointment (and final sticker shock) by asking yourself these questions before booking a room. You may consider buying a travel package, even if you don't really need it, because they often cost less than airfare alone. Offering a great way to see and experience a different culture, a volunteer vacation can be an especially fulfilling way to spend time off. The concept's not for everyone — no four-star hotels or five-course meals, and there's service work involved, making it less of a "break" — but it can be an affordable way to travel somewhere exotic and truly experience the other location separate from the confines of any resort. Here's a helpful planning guide. Airfare sales usually happen early in the week, while increases are usually put into place at the end of the week. Because there's no magic day when the best prices occur, it's best to sign up for email price alerts on all the travel sites that you use. Make sure to check up on your hotel before you book too! Avoid expensive tourist traps by asking locals for their recommendations, and save money by ordering area specialties. If the best deals you find are still too pricey, then opt for a local vacation for now and postpone bigger travel plans for the location's off-season. Instead, use up some of that hard-earned PTO and take a fabulous staycation in your own city. There's a trend of travelers booking lodgings in the neighboring town of the actual city they are planning to tour. By doing so, you can save up to 40 percent off the usual rate. But of course there are downsides to that strategy. Staying outside the tourist attractions will mean more time commuting, and you may have to rent a car if there isn't a good local public transportation system. Calculate those costs to see if staying in a neighboring city is worth it. A road trip may cost less money than flying, but filling and refilling your tank still isn't cheap. Utilize websites like autos.msn or gasbuddy.com, which track the prices of gas and sort by zip code, in order to find the cheapest place to pump while you're on the road. It's more effective to book travel with mileage points over the phone than online because for most airlines, you don't always get access to full inventory of award seats online. Prepare your car for the road by inflating the tires with air. Filling them up will ultimately save you money on gas. Keeping your lead foot to a minimum will also help you get the most mileage from your tank of gas, and you're less likely to be stuck with a pricey speeding ticket. When you're budgeting for your excursion, you must consider the inevitable cost of gas. Try using the AAA Fuel Cost Calculator to calculate the cost of your trip. The tool generates its calculations with average regional gas prices and the details you enter, including your starting city, destination, and your vehicle's make, year, and model. Because it uses regional prices, the calculation should be looked at as an estimate, but AAA does update the prices daily. Bring a full cooler along for the ride to save money and your waistline from too much fast food. But you'll need more than a bag of pretzels to get you by. Take ingredients to make sandwiches, containers with cut-up vegetables, fruit that doesn't require refrigeration (like bananas), and plenty of water. When traveling with friends, it can be tedious to split every expense. If your group doesn't want to bother with exact numbers until the trip is over, then simply designate someone to hold on to all the receipts. That person should write down the name of the friend who paid to make it easier to calculate who owes what at the trip's end. These are great trips. I love searching travel websites to save on traveling. There is something that makes traveling more exciting when you spend so much time and effort researching it and it is ultimately more exciting when you make it to your destination and you know you didn't blow your budget on it. Travel slower, the more you do and see the more it costs. Airbnb is the coolest thing, but I don't think I can ever venture to try it. I guess travel is all about the adventure though. I've always wanted to try a flash deal, but I'm terrified that I will end up some place that is normally beautiful but it will be the rainy season while I am there. I just discovered Airbnb and what a wonderful app! Not only for those looking for a cozy place to stay, but for those home-based businesses that are looking for a way to advertise their place! Niche resources like this will become ever more popular.